Soon after we’ve announced the launch of our new interface – SERPed 2.0, a lot of you guys reached out with your feedback, amazing suggestions on how to improve the existing tools, and new feature requests. 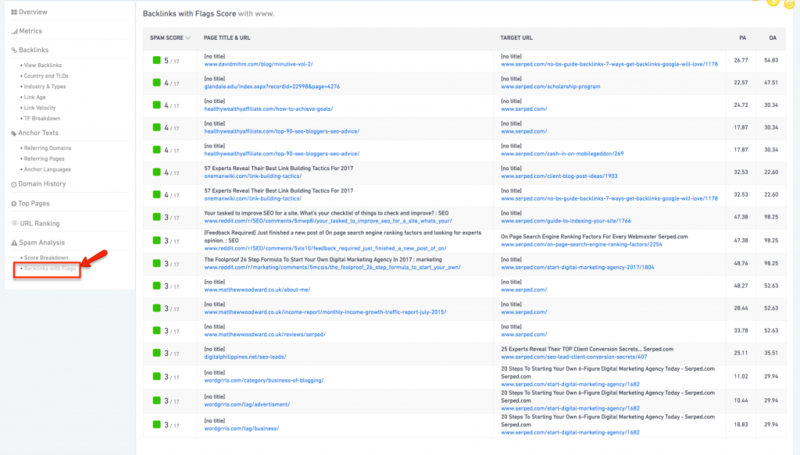 We brainstormed on it internally and agreed that if we can pull off a better navigation and show all the data in one view, it would be an amazing improvement to our Site Explorer tool. Change is opportunity… So we added a bunch more features too! (read on)…. After a good 6 mockups and around 294 dedicated hours of coding and testing, here we are. 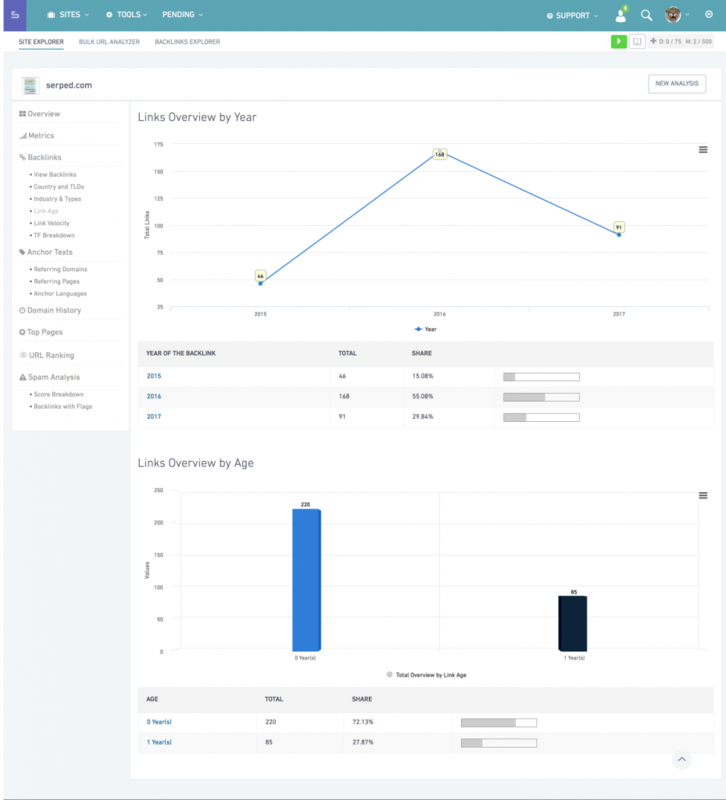 Ready to share the new Site Explorer with a complete makeover and more powerful than before. As you see in the above image, the layout, look and feel of Site Explorer has completely changed. Left side panel to see all the available options. All the critical data in one view. No more scrolling. 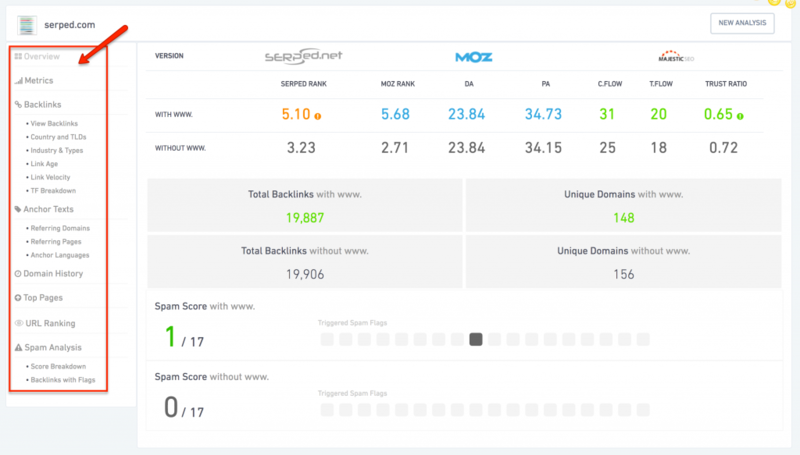 The data for the stronger version of your domain highlighted in the colored text. Don’t forget! To get access to all of this data you’ll need access to the SERPed tool. You can apply for membership right here. 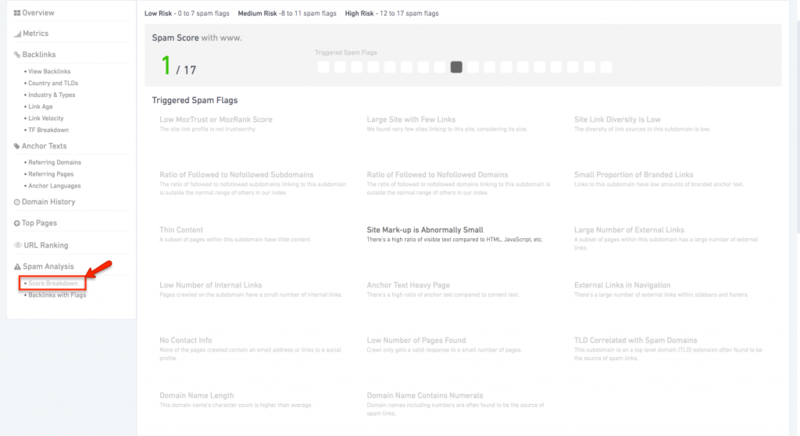 A) You can also dig deeper to know the reasons behind the spam score. Fix the reasons that are affecting your domain’s spam and bringing it down. B) Go one step further and check all the low-quality links redirecting to your domain. 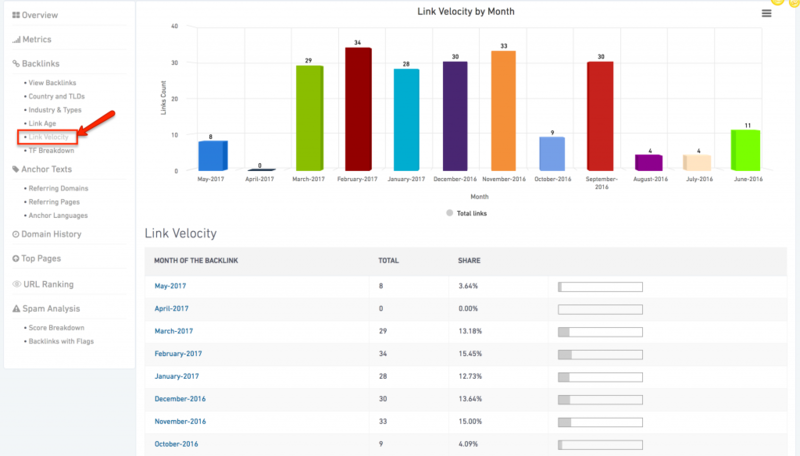 2) Link Velocity: Before we move to how you can use this awesome feature to learn how your backlink strategy is performing, let’s understand what link velocity is? To put in simple words; Link Velocity is a measure of how many new backlinks your website gets naturally over time.. Ideally, your backlinks should grow with time. A healthy link velocity graph is an upward curve. Using our Link Velocity tool, you can keep an eye on the over time growth of backlinks to your domain and take preventive measures if you notice anything fishy. 3) Link Age: According to Search Engine Journal, backlink age is one of the ranking factors. It is considered as a factor of trust. Our Link Age tool shows you the number of backlinks you earn each year and the percentage share. 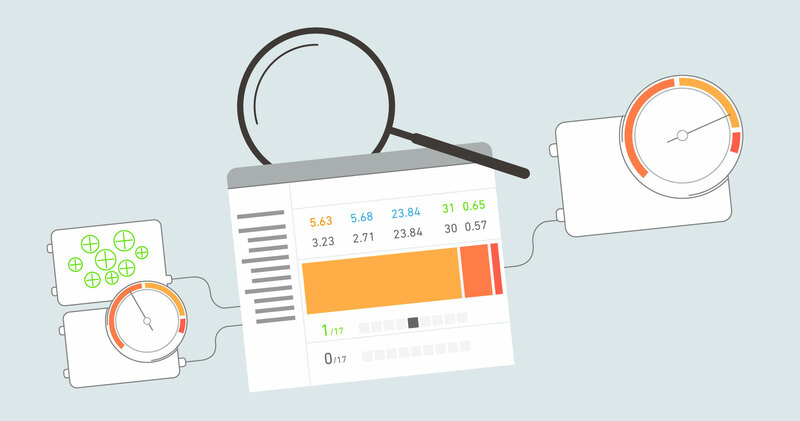 The intuitive graphs give a quick insight into your site’s backlink profile. 4) Anchor Language: This is one more interesting and experiential tool that we added in Site Explorer. It gives you a confidence score about the language of an anchor text that is used to link back to your site. Using this confidence score, you also get the hint about the predominant language used on the domain that is linking back to your site. It is your go-to tool if you are planning to buy new domains to build your blog network and looking to see what language it had previously built to it. We believe this new layout and new features will further empower you to take your SEO to the next step and serve you clients (if you do client SEO) better. Here’s a short and quick tutorial to walk you through each and every feature of our Improved Site Explorer. Hope you enjoy the convenience of the new layout and the power of new features! Excited to give the new and more powerful Site Explorer a shot? You can apply for exclusive membership right here. Let me know your thoughts regarding this improvement and feel free to reach out to us about anything related to SERPed.